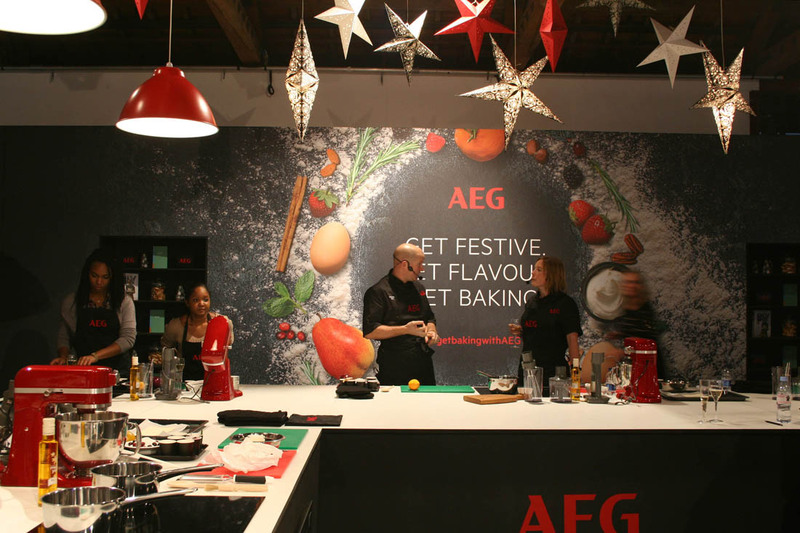 Christmas came early for me last week after a trip to Taste of London: Festive edition to take part in such a fun baking masterclass to try out the new AEG Mastery Range. 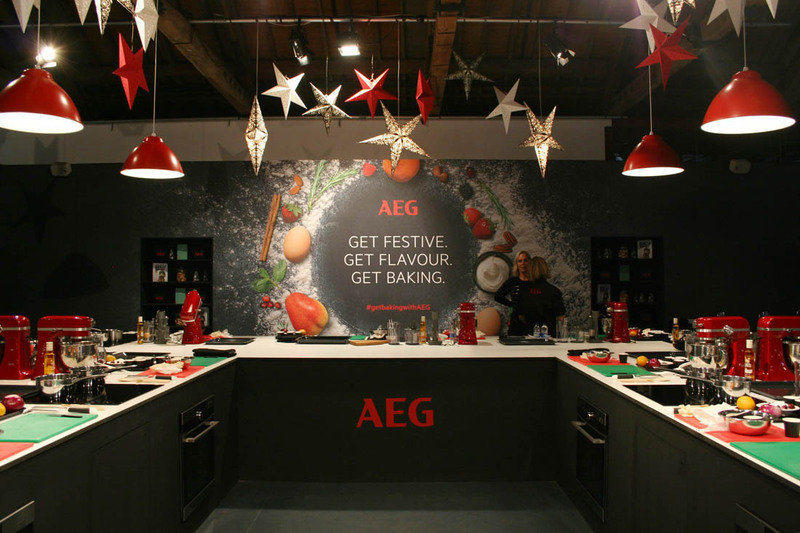 There were twinkly lights, Christmas trees, champagne whilst we cooked, festive recipes, and now a couple of AEG appliances on my Christmas list (Jules, I want this and this) – I’m ready, I’m telling you. Expertly led by Richard and Kathy they set us to work on one of Richard’s recipes for spiced sausage rolls, filled with orange, sage and chilli – yum! – and a cranberry chutney. 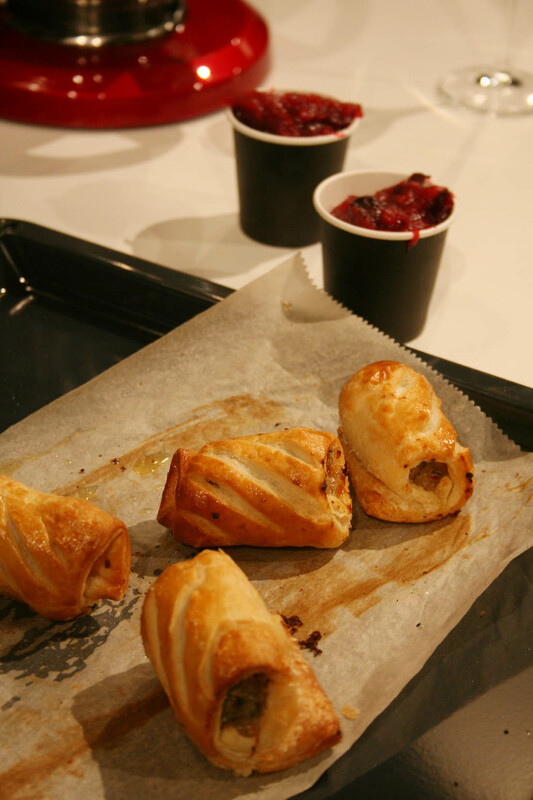 Making the sausage rolls themselves was super easy and after a little mixing and rolling they baked perfectly in the Steamboost Steam Oven as the steam browns and crisps, which is exactly what you want with pastry. However, I couldn’t quite work out how we were going to make an red onion based chutney in the small amount of time we had because it literally takes HOURS to properly cook onions in my kitchen. 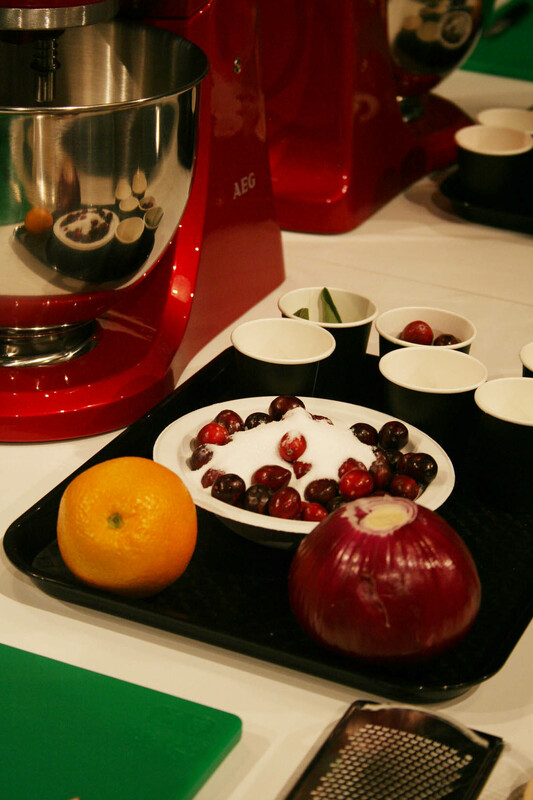 Firstly, we all need to be using a stick mixer for chopping our onions. Seriously, it’s life changing. 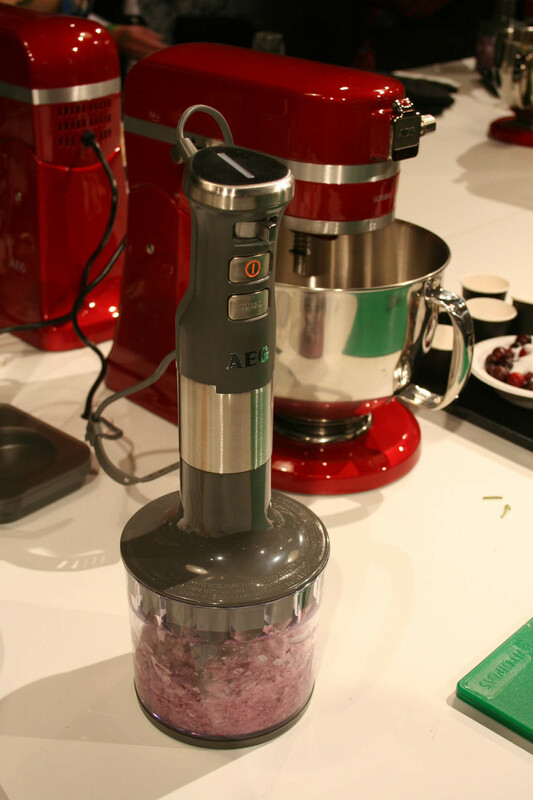 The AEG stick mixer is so quick and so powerful so my worst kitchen chore is no longer an issue. Also, I have only recently realised that blending onions almost to a puree for the base of sauces makes the cooking process so much quicker if you are short on time and it’s particularly good for cooking for a baby who can’t yet chew bits of onion. Anyhoo, it turns out the only reason it takes forever to cook sauces in my kitchen is because I don’t have an induction hob. 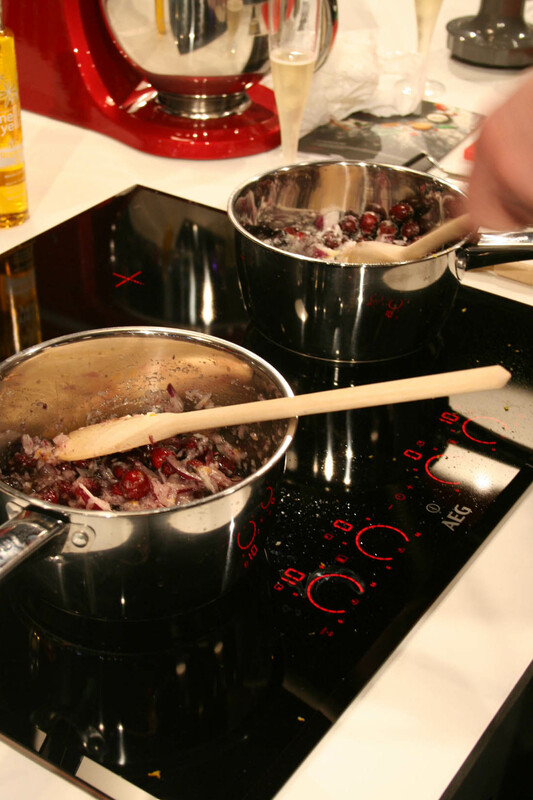 The new MaxiSense Pure induction hob that we used during the class is flipping amazing – we cooked that chutney in about five minutes. It heats so quickly, cooks so evenly and is super easy to control. It’s sleek too as it is completely black when not cooking. I WANT! So here are the finished spiced rolls with the delicious cranberry chutney (you need to make the chutney – it’s really, really good). 1. Put the sausage meat, salt, chilli and sage into a bowl and zest half an orange over the mixture, mix thoroughly with a spoon. 2. Lightly flour a work surface and roll out the puff to 10x20cm. 3. 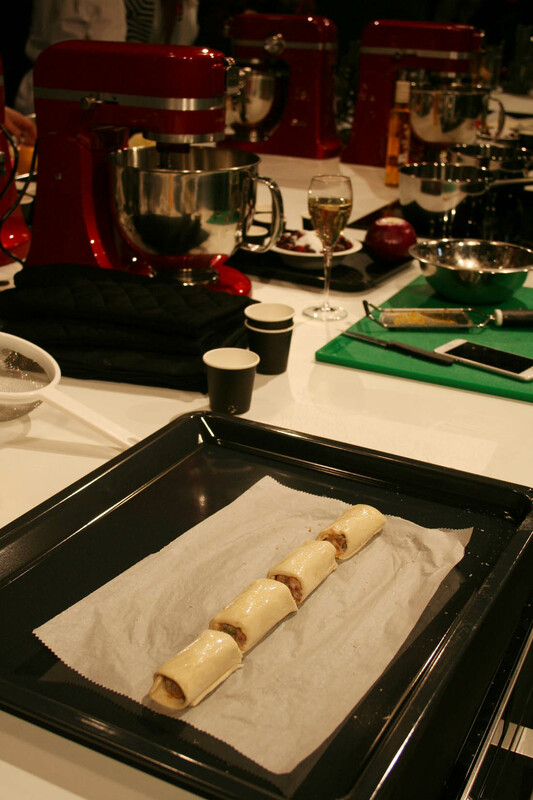 Shape the sausage meat into a ball and cover in flour, then roll out on the floured surface to 20cm long. 4. Lay the sausage meat onto the puff and paint one edge (of the puff) with beaten egg. 5. Roll the pastry over the sausage and seal onto the egg coated edge. 6. Cut the sausage into four equal pieces and brush with the beaten egg. Slash diagonally with the paring knife and bake for 20 minutes at 200 degrees (fan). 1. Finely dice the red onion and soften over a low heat in the saucepan until translucent. 2. Take 40g of the cranberries cut them in half and set aside. 3. Tip the remaining 130g of cranberries into the pan (with the onions) over a low heat and add the caster sugar, salt, vinegar, cayenne and the remaining zest of the orange. 4. Stir constantly for 5-10 minutes until the sugar has melted then turn the heat up (to a medium heat) and continue stirring until the cranberries burst (about another 5-10 minutes). 5. Take off the heat and stir in the remaining uncooked cranberries. 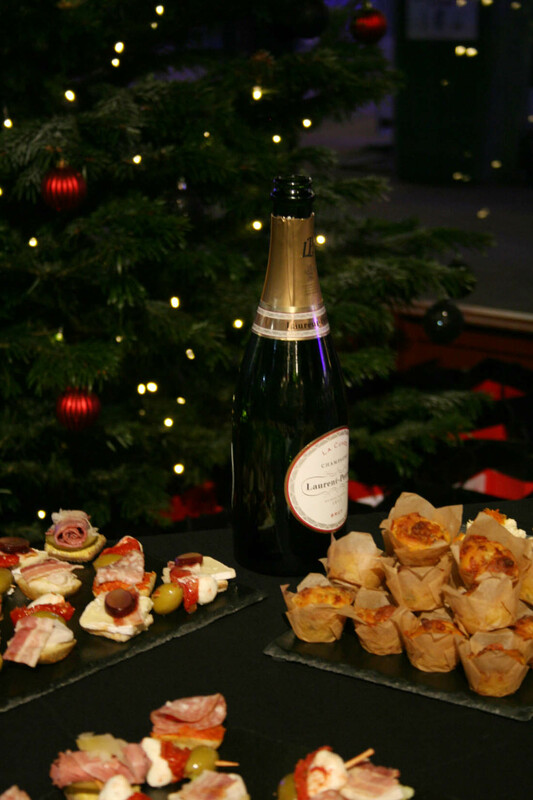 Ok, now I get to talk about all the twinkly lights, star decorations, champagne and canapes! 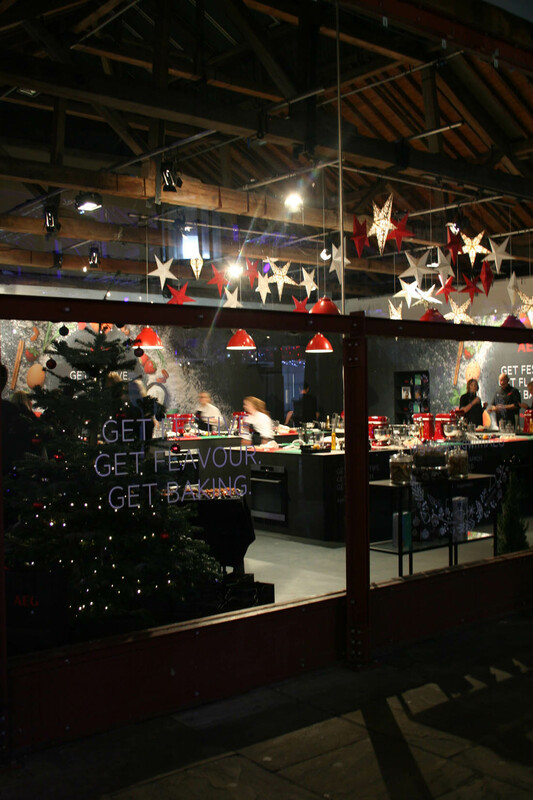 Christmas is nearly here, people!!! The event has got me very excited. *This post was written in collaboration with AEG. 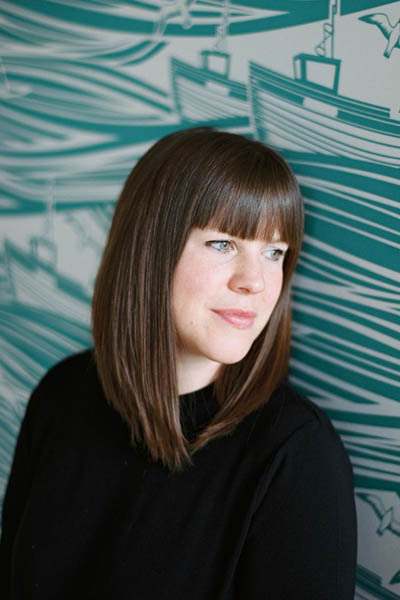 Previous Post WIN £250 to spend on blinds or shutters with Luxaflex! OOh – what a lovely day out. And great inspo for Christmas pressies. OK I am blending my onions forever now too! Looks like it was such a fun masterclass Katy, gutted I wasn’t able to make it!